With every song I produce I try to get as close as I can during tracking to what I’m hearing in my head. Committing to sounds and the overall vibe of any song early on has proven to not only lighten my workload considerably, but also sound better in the end. It wasn’t as easy to do this while tracking every source in a song like this with only one flavor of mic at my disposal as it would be with a variety of mics but it was not even close to difficult either. When it came to mix time I didn’t feel like I could not achieve anything I was hearing in my head for this song. I use Cubase’s stock plugins for a lot of my day-to-day mixing so I just did the same for this mix. They are flexible and sound really good to my ears. The plugins that I used that didn’t come with Cubase are available free (legally). The hardest part to get right of the whole kit was the kick drum. These mics roll off pretty much everything below 100Hz so there isn’t the same amount of low end that I would have to work with under normal circumstances. The song is in E, with E2 being 82.4Hz so I gave the kick mic a 3dB low shelf boost there. I also sweeped the low mids to find that cardboard-y/bouncing basketball sound and cut that a decent amount. To get the extra low end I wanted I also cheated a bit: I generated a 82.4Hz sine wave (with Cubase’s TestGenerator), with a gate triggered from the kick mic signal. I also blended the triggered kick samples we took (see pt.1) in there to give me some extra attack/slap. On my KICK buss there is also a HPF(high pass filter) at 20Hz. The SM57 is still the go-to snare mic in many, many of the world’s top studios today and we had a beautiful Ludwig Black Magic snare to work with, so getting a cool snare sound was not difficult. I gated the snare and blended that with the triggered snare samples to a buss. On the snare buss, I added a HPF, a wide boost at the snare’s fundamental frequency (around 210 in this case). as well as a high shelf boost at 8KHz to give it some top end. I also felt like I wanted the snare to snap some more, so I used Cubase’s EnvelopeShaper (basically Steinberg’s version of Transient Designer) to help me get that. I like lots of compression on toms to bring out the sustain and power so I used a combination of EnvelopeShaper (with the Release boosted) and Vintage Compressor to get the toms to sit the wanted it to sit. Since it’s only a floor tom and I liked the low end, I had the HPF at 20Hz. I also boosted a bit at 100Hz, gave it some high-shelf boost at 12KHz and cut some low mids at 475Hz (after sweeping) to get rid of the “cardboard”. Apart from the toms in the actual drum track, there’s a pair of tribal-sounding toms that we overdubbed and panned creatively to make the pre-choruses feel wide and powerful. They were treated the same way as the other toms. The SM57’s actually surprised me on OH as they weren’t as dark as I thought they’d be. I only gave them a wide high shelf boost of about 3dB at 12KHz and a HPF at 80Hz. I always use Bootsy’s FerricTDS, a free tape simulation plugin, on my drum buss. Used lightly, it seems to really bring drums together and give it just a little extra “something”. I also had a subtle high shelf boost at 8KHz and a slight cut at 350Hz. All percussion (shakers, tambourine, triangle) have fairly high HPFs on them. The “intro” right after the first chorus has some percussion that was treated with a lo-fi/telephone filter to give it some vibe. I only worked with a mic’d cab for the bass sound in this song. I gave it a touch of low-shelf boost at 100Hz. We often forget that the highs and mids are as important for a good bass guitar sound as the low end. Your ears can’t hear that massive low end if you don’t give them something to find it with. I added a high shelf boost at 5KHz to give the bass sound some clarity, along with a small amount of 1KHz to bring out the power in the notes. There is also a HPF at 20Hz. Even though I tracked with a fair amount of compression I still felt like the bass wasn’t sitting 100% as I wanted it to, so I knocked off a couple of peaks just a touch with some compression from Vintage Compressor. I got very close to the sounds I wanted for the mix during tracking so I only added HPFs (80Hz on one track, 120Hz on another) and a slight cut at 4160Hz on one of the guitar parts, where I felt that the high mids got a little annoying. I always try to get the sound that I need finalized during tracking. I hate having to “work” guitars too much during mix time. Processing consisted mostly of HPFs and LPFs (Low Pass Filters). There’s something cool that happens on the LPFs on some analog consoles where, depending on how they are setup, there is a slight boost just before the rolloff. 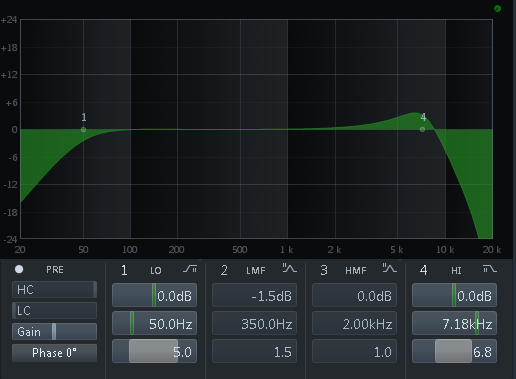 Cubase’s channel EQ has a LPF that mimics this and I sometimes use it to my advantage to brighten up guitar parts while still getting rid of any unusable high-end information (aka fizz). I didn’t feel the need for any compression during the mix. LPF with a slight rise just before the rolloff. I sent all my electric guitars to a stereo buss, where I took out a little bit of 350Hz, which cleared up some lo-mid mud and I added a very subtle, wide shelf boost at 16KHz to open the guitars up a little – really just to sweeten them. I compressed and EQ’d the vocal going in so I didn’t use any additional compression in the mix. I did add a HPF at 80Hz and a high shelf boost at 16KHz to add some “air” to the vocal. I always do a lot of vocal riding (aka volume automation) on vocals. I also used a combination of volume automation and the stock de-essing plugin in Cubase to smooth out s’s. To give the vocal a bit more “size” and make it “pop” more in the mix I had 2 wide-panned, slightly delayed, copies of the vocal that were tuned +8 and -8 cents and HPF’d at 3KHz mixed in with the main vocal. This comes from an old trick that was used in the 80’s with Eventide’s to make vocals a bit bigger. BGV were tracked with the same chain as the mains, so no additional compression was added in the mix, but I did ride them quite a bit. EQ was a HPF at 120 Hz, a cut at 350Hz and a subtle high shelf boost at 16KHz. I treat Cubase as a mixing console so I’ll always have a couple of sends setup. My main sends are usually a couple of different reverbs (but not so different that things sound like they’re in different spaces all the time), delays at different note-lengths. In this mix the reverbs plugins used were Cubase’s REVerence convolution reverb plugin. One instance was loaded with a PCM 90 plate impulse response, used mostly for drums, and another was loaded with an impulse response from Bricasti’s Concert Hall preset. Both had quite a bit of low end filtered from them to not muddy up the mix. 1. A 1/4-note delay with some HPF and LPF to give it a bit of an analog feel, which gives me more depth. 2. A ping-pong delay that went into some subtle phasing and quite heavy filtering for effect. 3. A more standard 1/4-note ping-pong delay, with some HPF and LPF. Main vox and BGV are sent to the #1 delay. While the main vox weren’t sent to any reverb, the BGV were sent to the Concert Hall reverb. During parts of the song, the kick and snare, along with their reverbs during these parts, are sent to the #2 ping-pong delay, which creates a nice “drum-loop”-type vibe on the sides of the mix. Tons of vibe! Throughout the mix the snare and toms were sent to the PCM90 reverb. The high, synthy guitar riff during the choruses are sent to the #3 ping-pong delay to make it soar “around” the mix a little. While different guitar parts were sent to various effects, depending on the parts, I should mention that I like to add some depth to main rhythm parts by sending them to a subtle delay (the #1 1/4-note delay in this case). I really like the way SSL-style compression on the stereo buss “glues” a mix together. My favorite flavor of this is the TK Audio BC1 (I have the mk2 version). I had 2-3 dB of gain reduction going at a 4:1 ratio, 10ms attack time and release time set to “Auto”. I also had an EQ on the stereo buss, taking out a very small touch at 350Hz and boosting a little at 10KHz. The boost, rather than being a shelf, is a very wide bell. I use this often as a way to mimic the way a Pultec-style EQ works and I find that it brightens up mixes without making it as harsh as a shelf EQ sometimes does. As much as this was a super fun experiment, it was also a really great learning experience. It taught me again how important it is to commit early on. It also refreshed and reinforced to me that every piece of gear is just a tool. It doesn’t make or break a song, and there are always means to get what you need even if it means having to work a little harder. And it made me love my trusty SM57’s even more than I did before.